If you don’t know what’s going on in a system, it’s very hard to know how to respond to it. Those who have information are powerful, those who share information empower others. Some of that is about big stuff, but some of it is about very small things. So in the next couple of days, there is likely to be a strike of London Underground workers, which will result in substantial disruption to the network. The question is how much and where. Transport for London know that’s what we want to know, and provide a prominent link on their home page. So far so good. Could there be a better way? It turns out that there could. The tube is of course famous for its map, and what better way to give an immediate impression of what’s going on than with an appropriately adjusted one. Enter Ian Mansfield, the eponymous writer of IanVisits, who has done exactly that (with a link there to a much bigger version). 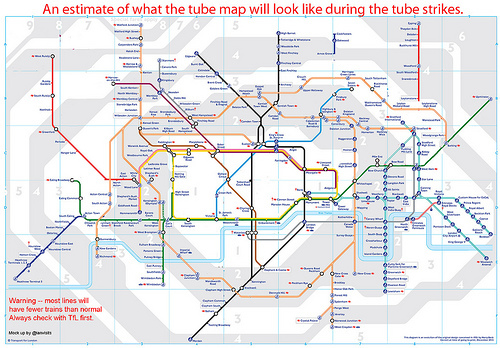 The map doesn’t tell you everything – it doesn’t say anything about likely frequencies, for example, but it tells you a lot very vividly which isn’t immediately obvious from the TfL text. Barking is the only station open between Upminster and West Ham. You can get a train from Cockfosters, but it won’t take you very far. This isn’t about lack of capability. TfL are doing some rather good work on a replacement for their website, with some very smart people working on it (even if I have been a bit sniffy about aspects of their approach). But it’s certainly about a missed opportunity to use design thinking. So all credit to Ian – though we really shouldn’t have to rely on him.